TEL AVIV, Israel -- UEFA president Michel Platini made a direct appeal to the heads of Poland and Ukraine's football federations Thursday, demanding they step up their efforts to ensure everything is ready for Euro 2012. Platini, addressing delegates at the annual UEFA Congress, told Ukraine's Grigoriy Surkis and Grzegorz Lato of Poland that they must not allow preparations for hosting the tournament to fall further behind. "Mr Surkis, Mr Lato it is imperative that you steer a steady course as you approach the final straight. I believe in you, we believe in you," Platini said in front of delegates from UEFA's 53 member nations. "Remember in only 27 months the eyes of the whole world will be on you. So don't take your foot off the pedal, but step up your efforts." Economic troubles, a severe winter and political difficulties have led to delays in the build-up to the 16-team tournament, which is being staged in eastern Europe for the first time. Preparations in Ukraine have fallen five months behind schedule with particular problems in Kiev, which is due to stage the final, and the city of Lviv, where serious delays have restricted construction work on the stadium. "Conditions may not be exactly the same as at the two previous European Championship final rounds," Platini admitted. "We have faced many difficulties in these two countries, but having visited Ukraine and Poland I can tell you the people in these countries are proud to be welcoming European football on to their soil." Platini also reiterated that UEFA's determination to stamp out illegal betting on matches, which he identified as "the greatest danger" faced by the game, "the one that can kill football." Platini said the fraud detection system set up after last year's congress in Copenhagen was bearing fruit. "The cheats now know that they are being hunted down and watched and that when they are caught, and believe me they will be," he said. "They will face disciplinary sanctions that could lead to lifetime bans from football. Coaches, directors, players and referees must help us in this fight. We are operating a zero tolerance policy and we will continue to do so until the very end." 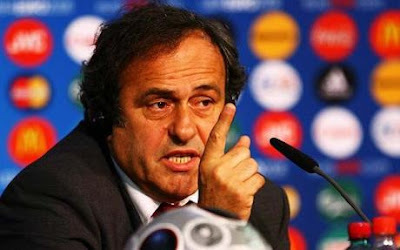 Platini was less bullish, however, on the matter of illegal transfers, or what he described as "trafficking of minors." A year ago Platini told Congress that he was determined to persuade political institutions to allow UEFA to restrict the international transfers of players aged under 18. "Today I cannot tell you that we are on the verge of meeting this challenge because it is undoubtedly the area in which progress is proving hardest to achieve," he told the congress. "We must be realistic, we will not perform miracles in this area. Those who want to circumvent the rules will doubtless find a way of doing so. "But I firmly believe it is our duty to protect children, it is a social battle we are waging, a noble and just battle."